So at 28 years of age I finally acquired my driving license. Don’t snigger… I spent the better half of my twenties in London…and driving over there was just a decadence that I could not afford. So anyway, with a license comes some wheels. So I treated myself to a brand new Nissan City Micra. Nissan do them in 15 splendid colours all named after a particular city. I chose Madrid Black. Ain’t she cute? Small and curvy…a bit like me. Dontcha think it kinda looks like a London cab? So I’ve kinda driven one all along anyway! Kinda. As she resembles the famous car from the Big Smoke, I’ve naturally named her Queen Lizzy. 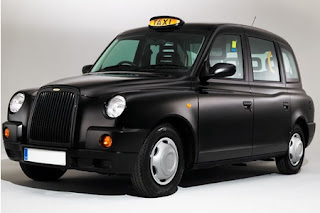 And If driving a black cab is good enough for Mossy…well then…you know the rest. Oh, your car is precious. Mine is a '92 toyota pick up. His name is Razz (short for Razzmatazz-name of a crayola crayon). And your nails are mesmerizing. Is that normal? I wanted the black one initially haha! I'm now glad I got the blue, but the black is very chic!